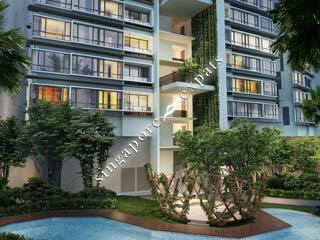 D'Nest is an upcoming condominium launch by City Developments Ltd (CDL) and Hong Leong Holdings. Located just minutes away from Pasir Ris MRT(EW1) and the adjoining White Sands Shopping Mall, this luxurious condominium offers residents easy access to shopping, dining and entertainment amenities. Developed on a large land area of 41,000 square metres, D'Nest is designed to cater to the needs of every individual. Boasting a range of 1 to 4 bedroom units, 5 bedroom dual key units and 10 penthouses ranging from 5 to 6 bedrooms with dual key, D'Nest offers a diverse selection of unit sizes that span from 484sqft to 3,455sqft. Every unit is thoughtfully designed to optimize the use of space and layout. With lifestyle living as the epitome of its creation, D'Nest engage its residents with a spectrum of over 60 recreational facilities that sets the rhythm for a world of luxury, refinement and pleasure: Karaoke Studio, Music Jamming Studio, Sky Terraces, Art Studio, Aqua Gym, Spa Sanctuary, Skating Rink, Jogging Track with distance markings, Kid's Cross Training and Picnic Lawns to name a few.